or How to Fall in Love with Lemons in Capri, Then Grow your Own Lemons to Make Your Own Limoncello in an Effort to Pretend You are Back In Capri. But first, a note to my Dear Reader: My When Life Gives You Lemons … Drink Limoncello post turned out to be quite the tome, what with all the who, what, when and why, so I have broken it in to manageable chunks. A series, if you will, in 5 parts. I hope you’ll forgive my self-indulgence and stick with me through this series. I love Capri. And I love lemons. In fact, I love lemons because I went to, and fell in love with, Capri. True story. Some years ago now my sweet husband and I found ourselves on the beautiful Isle of Capri. 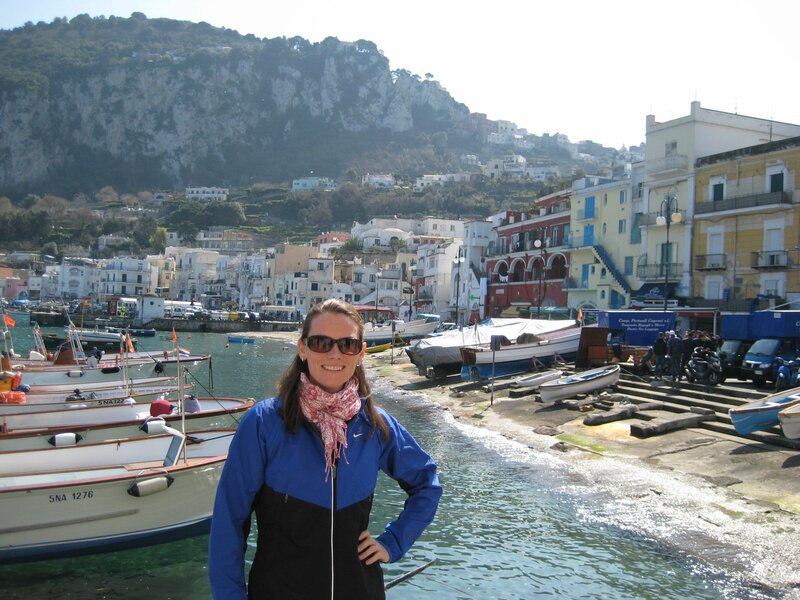 Capri, Sorrento and the whole Amalfi Coast are like something from a fairytale. Every vista is breathtakingly beautiful, without exception. The greens are exceptionally vivid and lush. The azure blue of the sky and water so azure-y and blue-y. The food, incredible. The people, deeply content. It is as though it really isn’t real and yet … it is! So amazing. If you ever get the chance to see that part of the world don’t think twice – Just Go! One things you’ll see all through the Region of Campania is lemon trees. They were everywhere and thriving like nothing I’d seen before. The scent of citrus wafting in the breeze was quite intoxicating. Heavenly. Right then and there I fell in love with Capri and with lemon trees. 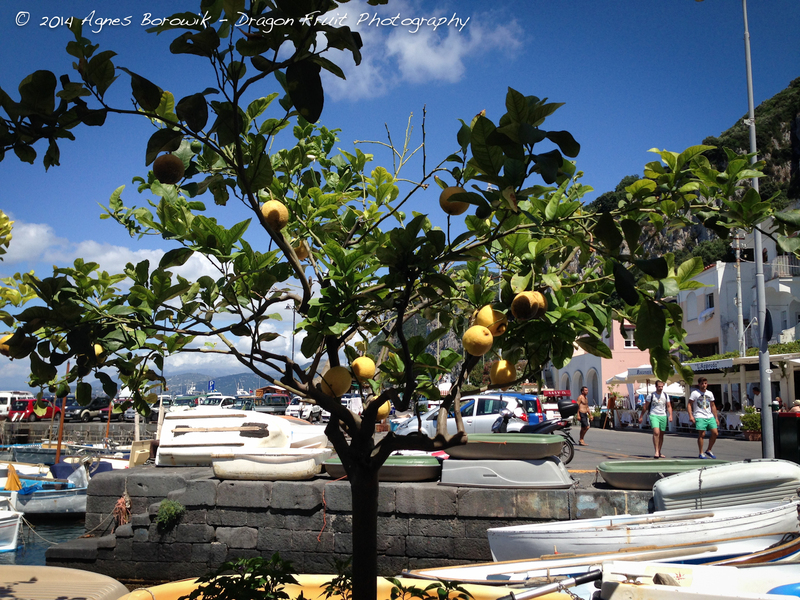 Lemon trees are everywhere in Capri. Look at this fella peeking his head over the side of the wall to see who is walking past (too anthropomorphism-y? My apologies). You see, I wanted to show you, Dear Readers, what I mean. Show you my original inspiration. But as I search through my photos of Capri and the Bay of Naples I can’t find any pictures of Caprian lemon trees in blue pots. Wait. What? I know. I’ve been looking now for longer than I care to admit, at home and on the interwebz, and yet there are no lemon trees in blue pots at all. At least not genuine Italian ones. There are plenty of blue sky and water behind lemon trees, which may or may not be potted in terracotta pots. See …..
And yet I vividly remember the yellow and blue! So visually stunning. So inspiring and yet … non-existant it appears. What??!! My whole story here has been built on a lie, one I’ve been living since coming back from Italy and buying a lemon tree and a blue pot! I am having a moment here, people. Oh. Em. Gee. But I’m telling you, gorgeous lemon trees in blue pots are stunning. And yet so simple! And thusly inspired by my trip to Capri I wanted to recreate/fabricate the same feel here at home. The only hiccup is that I don’t live in Capri (sadly). I live in Charlotte, NC, USDA Zone 7b which is not citrus friendly. Our winters get too cold and citrus trees will not survive the freezes we get. Gah! Why?? Why???? (shakes fist at the sky). There had to be a way. Have you been to Capri? 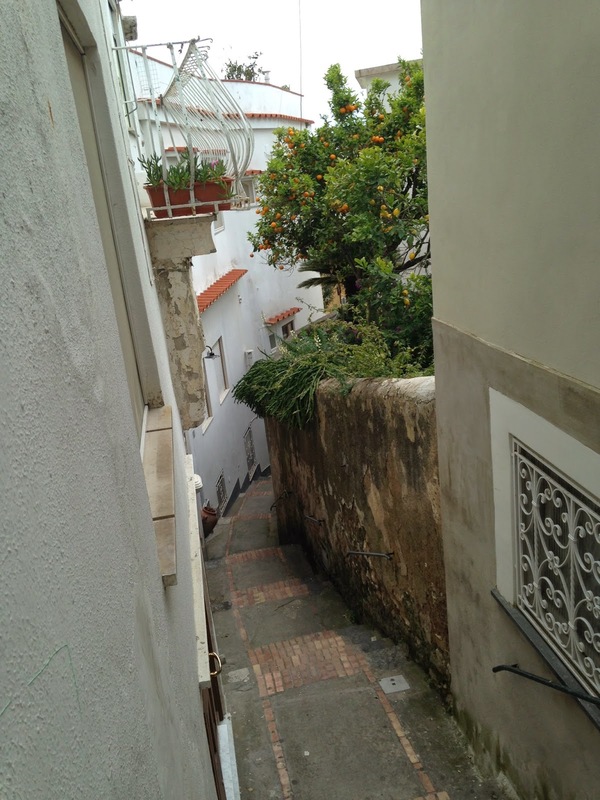 On my bloggy travels I came across Kelly and Dan and their fabulous blog, Foodie Lawyer, who tell the same story as me: That they went to Capri and fell in love with the lemons and decided to grow them back home. Love their story and love the Lemon Veal they make with their Meyer Lemons. Totally going to try that one soon. ← WHEN Is Spring Coming?